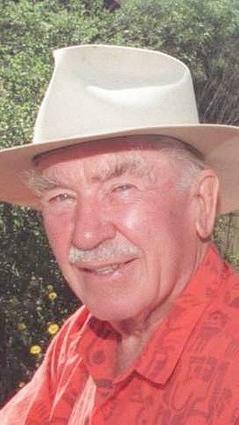 Milt McAuley was a long time and very active member of the Santa Monica Mountains Trails Council. Milt helped to plan and promote the Backbone Trail, wrote popular and authoritative books on local hiking trails and native plants, and regularly led trail maintenance outings. It was with great sadness we learned of his death on December 10, 2008. He touched many lives with his work, as you can see in his Los Angeles Times obituary and memorial photographs and the personal recollections below. Updated April 2015 The U.S. Board on Geographic Names/Domestic Names Committee voted to name a peak within Malibu Creek State Park in honor of the late Milton (Milt) McAuley (1919-2008). Milt McAuley was an author, conservationist, and trailblazer, who worked to preserve the Santa Monica Mountains and make them more accessible to the public. His exemplary life embodies the Mission of State Parks and is a well-deserved honor. This peak is just off the Backbone Trail on Mesa Peak Motorway and has a view that surely would have brought a smile to Milt's face. Click on the link to open Google Maps. Almost 20 years ago I was one of those who signed up for a hiking class through the Learning Tree, not so much because of a love of the outdoors, but because I was searching for something. I wasn’t sure what, exactly. An activity, preferably healthy, to occupy my time. An opportunity to meet people socially. I found all that, and more, through Milt and Maxine McAuley. Milt led us, with Maxine as trail sweep, on many fun filled hikes, regaling us with many stories. Whether he was describing the history or geology of the land around us, or recalling stories from his childhood or from 20 years in the Air Force, he clearly enjoyed teaching and sharing his life. In the spring Milt added wildflower walks to his classes. A self-taught botanist, Milt loved teaching others how to identify the local plants. Many of us treasure the Wildflowers of the Santa Monica Mountains book, as well as various hiking guide books, he wrote and published. When it was too hot to hike the Santa Monicas in the summer, Milt led us to trailheads in the San Gabriel Mountains. As one of the key holders to the Sierra Club’s Mt. Baldy ski hut, he took several groups for weekend trips to the hut that included his famous chicken cacciatore supper. Besides the pleasure Milt took from leading these hikes and any monetary compensation, he had an ulterior motive. He was recruiting volunteers for trail maintenance crews. Most of the people I worked with on trails in my early years with the program had learned about it, and been seduced into joining, by Milt. As important as his work was on the Board of Directors of the Santa Monica Mountains Trails Council, many of us know him primarily through his hands-on leadership out on the trails. If there are no trails in heaven, Milt will flag their routes and recruit volunteers to build them. Less well known to some of Milt’s SMMTC colleagues was his involvement in the Ventura County Archaeological Society. It was through him that I became a member and made new friends. I first joined, at Milt’s urging, to participate in the annual Native American Rock Art Caravan which travels to various sites in California and surrounding states to view and photograph petroglyphs and pictographs left behind by Native Americans, another of Milt’s interests. My interest in archaeology began with that first trip, as I’m sure Milt intended. For several years Milt and I carpooled to the monthly VCAS meetings, until he could no longer attend. Maxine prepared a much appreciated home cooked meal before we started out on our drive from Canoga Park to Newbury Park. The VCAS Board of Directors also benefited from Milt’s service over the years. It is safe to say that Milt lead a full life. His sense of service was strong and long-standing. Whether as a 16-year-old scout leader in Oregon, a husband and father, an Air Force officer serving in Arizona, Japan and Labrador, a SMMTC and VCAS board member, or a hike and work crew leader, Milt answered the call. He knew how to enjoy life and to give back at the same time. Milt touched many lives as a teacher, guide, friend and inspiration. We will all miss him greatly. Everyone loved and respected Milt McAuley. How could you not? Milt touched so many lives in so many wonderful ways. It was not just his love of hiking and of nature that he shared, but his love of life, his wit, his humor, his enthusiasm, his joy. Milt had a way of lifting your spirit with a simple remark, of challenging your intellect with a question, of soothing your heart with a gentle smile. My life, as was many others, was enriched by his friendship. So rather than dwell on the sadness of him not being here in our lives, let us keep the joy of Milt’s indomitable spirit in our hearts. See our Spring 2009 Newsletter for additional personal memories about Milt. A memorial to celebrate Milt's life was held at Paramount Ranch on Sunday March 8, 2009. See photos of the event taken by Ed Stauss. Click the "Donate" button below to give to the Trails Council in honor of Milt. You will be redirected to the PayPal site to enter your credit card details for your donation. The SMMTC is a volunteer, tax deductible, nonprofit 501 (C) (3) charitable organization.